WikiLeaks has been experiencing some issues lately ranging from having its Web hosting services shutdown to having its accounts frozen and the flow of money cut off. Some cheer those actions, while others see them as an attack on liberty and free speech and are coming to WikiLeaks' defense. WikiLeaks is no stranger to controversy. Exposing confidential government documents and communications evokes a passionate response--either for or against the activity. The WikiLeaks site has been the target of DDoS (distributed denial of service) attacks--either by government agencies that don't want sensitive information exposed, or by activist groups that believe WikiLeaks is a threat to international diplomacy and national security. However, there are also hacktivists--a mashup of hackers and activists--who are willing to cross some lines to defend WikiLeaks as well. The Swiss bank that froze WikiLeaks founder Julian Assange's assets, and PayPal--which cut off the WikiLeaks account used for collecting donations to fund the site--have both been targeted by DDoS attacks of their own. Noa Bar Yossef, senior security strategist for Imperva, commented via e-mail to say, "Operation Payback's goal is not hacking for profit. In the classical external hacker case we see hackers grab information from wherever they can and monetize on it. In this case though, the hackers' goal is to cripple a service, disrupt services, protest their cause and cause humiliation. In fact, what we see here is a very focused attack - knocking the servers offline due to so-called 'hacker injustice'." Botnets and DDoS attacks are not new. 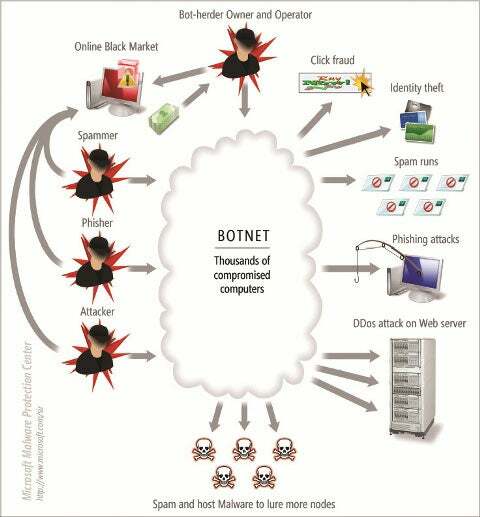 Botnets are exceedingly common. Typically, PCs of unwitting users are compromised in stealth and sit idly waiting for instructions from the attackers. A botnet can harness thousands, tens of thousands, or possibly hundreds of thousands of compromised PCs at one time to mount massive spam distribution or denial of service attacks. The WikiLeaks defense is a different story, though. Noa Bar Yossef explains, "In this case however, the Operation Payback is recruiting people from within their own network. They are actually asking supporters to download the piece of code, the DDoSing malware itself, that upon wake-up call the computer engages in the DoS. There is no victimized machine as the participants knowingly engage in what they call an act of defiance." In other words, rather than simply harnessing the combined power of infected machines without the PC owner's knowledge or consent, the Operation Payback hacktivist botnet is actively seeking volunteers to willingly join the botnet and assist in the effort to make organizations pay for trying to silence WikiLeaks. WikiLeaks walks a very thin line between paragon of freedom of speech and threat to national security. Even if you have strong opinions one way or the other about Wikileaks, I don't recommend volunteering to compromise your PC in support of any hacktivist efforts. You can't be sure that is all the malware is doing, and you might not be able to control or remove the botnet code once your hacktivism days are over.